The #1 PowerPoint Timeline Maker for Windows and Office. Create PowerPoint timelines as fast as clients and executives need them. Simple but powerful PowerPoint add-in that anyone can use to quickly make and manage impressive timelines. 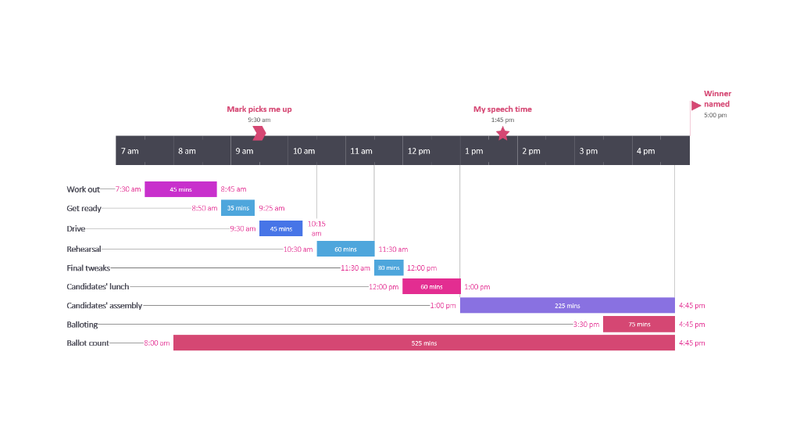 Build stunning PowerPoint timelines without the effort and cost. 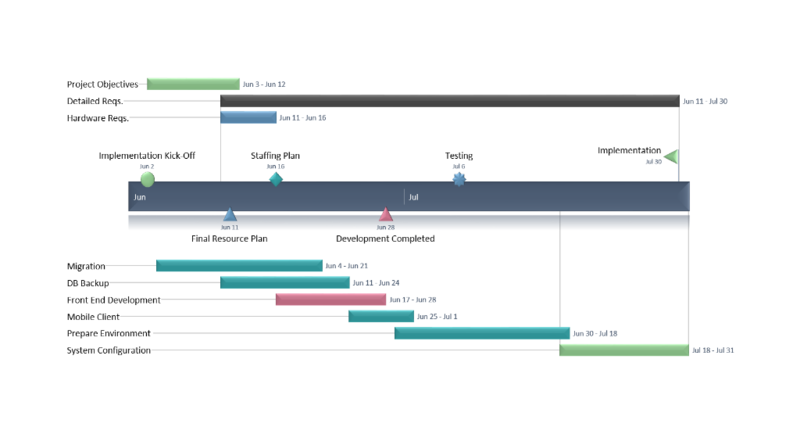 Free yourself from manually building and managing visual project plans. 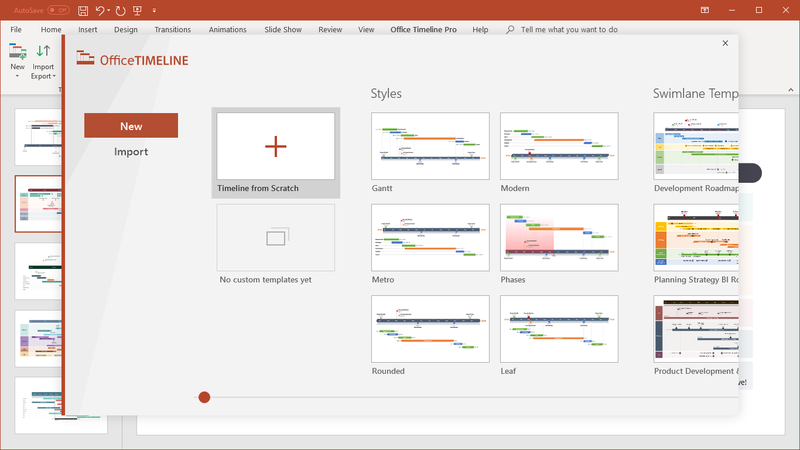 Office Timeline helps you make timelines in PowerPoint almost instantly. Customize them with just a few clicks to create clear, elegant high-level presentations that everyone will understand. User-friendly PowerPoint timeline generator. Works the way clients and colleagues do. 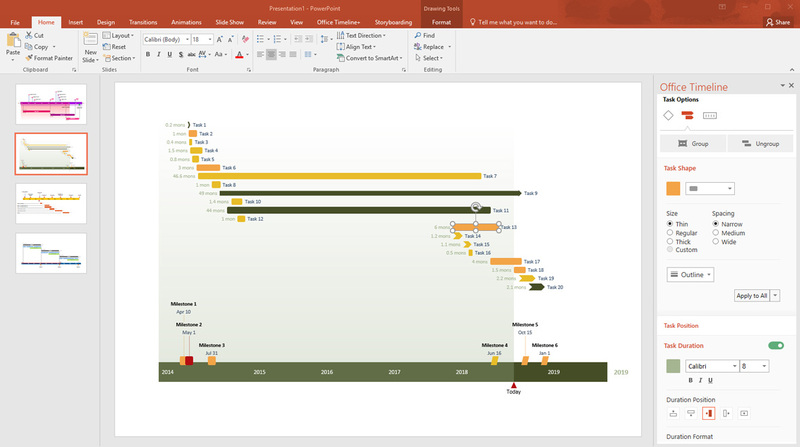 Office Timeline works with all versions of PowerPoint. 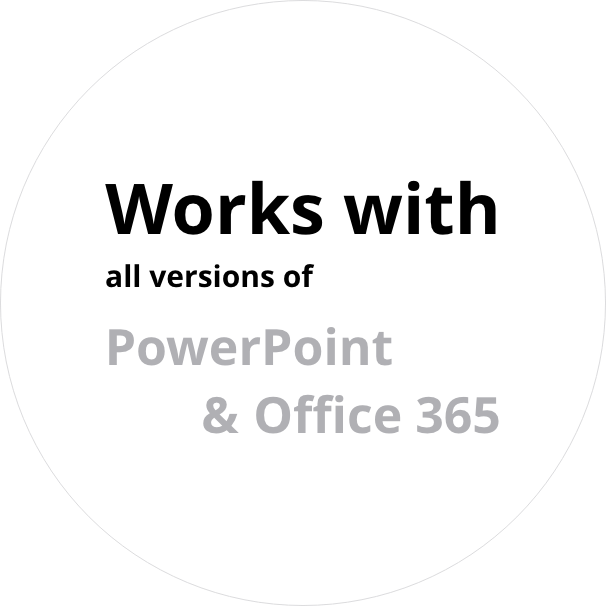 Give them stunning PowerPoint slides that can be viewed, edited and shared by anyone who has Microsoft Office. Manage and change data with ease. The plugin’s powerful Data Entry wizard makes timeline creation and management agile and intuitive. Updating timelines when projects and plans change is quick and easy. Start from scratch or pick a template. The timeline wizard was designed to make it simple. It all starts by selecting the type of timeline you want to make. Enter your data and click Create. 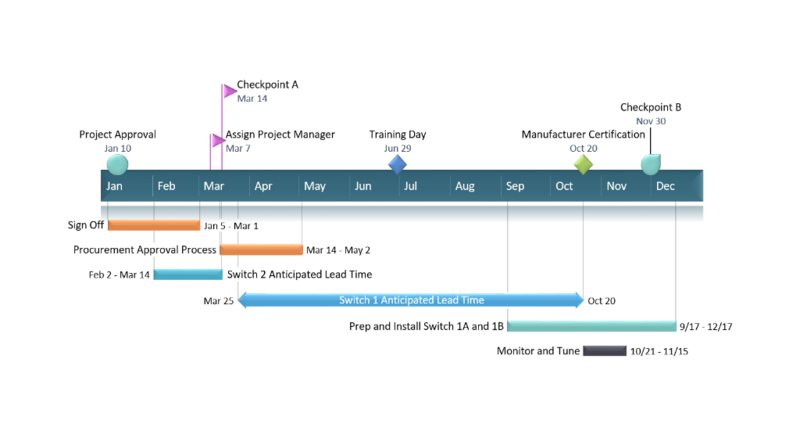 Once you’ve selected a timeline template, enter or import your key milestones and tasks. Set their dates, click the Create button, and voilà! 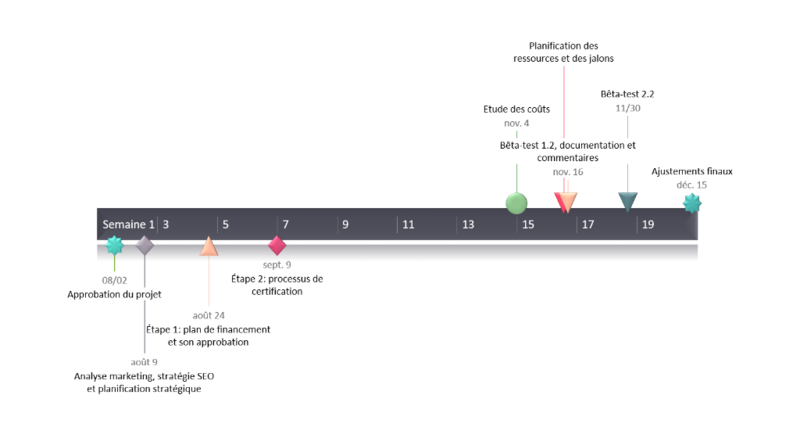 Timeline created. Customize it your way - colors, shapes, text positioning, date formats, timeline scale, today marker, task duration, percent complete… change any detail, anyway you want. Free PowerPoint timeline add-in: no sign-up needed. 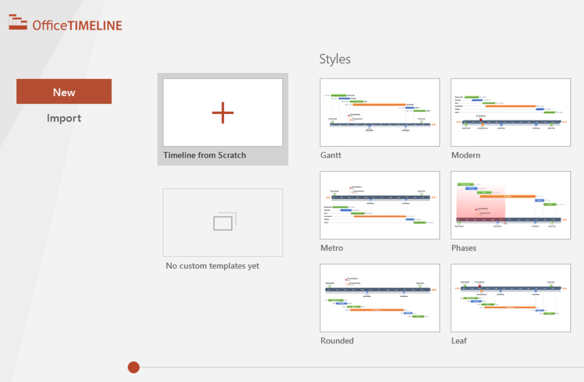 Office Timeline makes it simple to quickly create remarkable PowerPoint Timelines. It has a wide variety of stylish templates to choose from and my timelines are constantly getting compliments from management and customers. The ability for me to quickly and easily update a timeline for a project or presentation sets this software apart from any other product on the market. Well worth the money. In a word... #OfficeTimelineRocks! 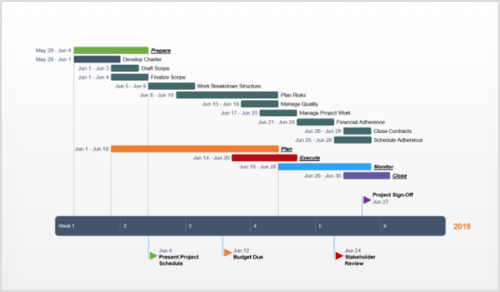 Office Timeline is a great tool for creating visually appealing and easy to understand PowerPoint schedules. The ability to import existing data into Office Timeline (e.g. MS Project) and then edit is invaluable. I use this on a weekly basis and would not want to be without it! Anybody can make an impressive PowerPoint timeline in less than a minute. Download the free PowerPoint timeline builder. 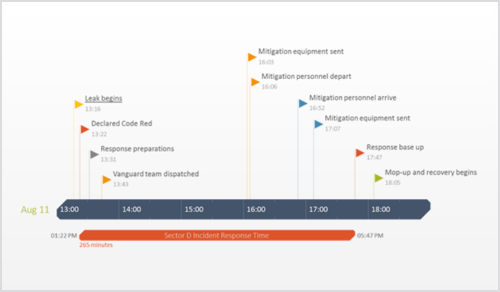 Office Timeline Free Edition creates professional looking Gantt charts and timelines, quickly. Download the add-in and start building your first project slide now. See the power of Plus Edition. 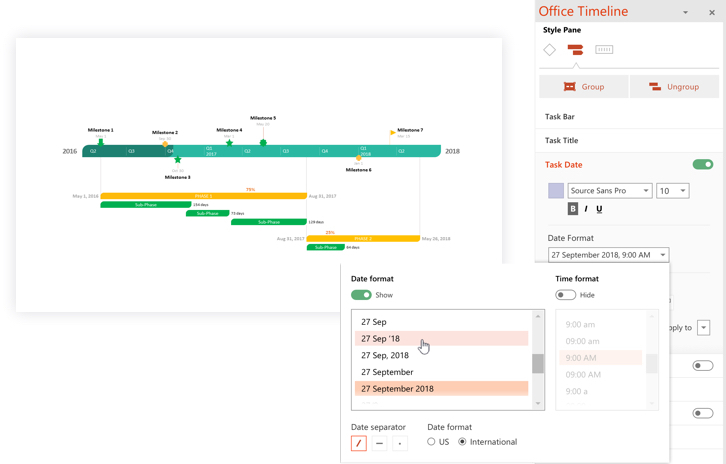 Although the Free edition is fully functional, Office Timeline Plus does so much more! Plus Edition unlocks over 50 customization and productivity features to help you create uniquely distinctive PowerPoint timelines 60% faster. This means you spend less time building project visuals, and more time managing your business.